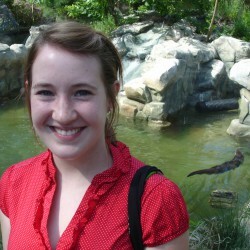 Library and information science grad student at Syracuse University. Goal: read 300 children's or young adult books before graduation in May 2015. Hannah is 15 and pregnant. Aaron just transferred to the school, fleeing a dark secret. Both of them could really use a friend. When humiliating rumors begin to fly at school, Aaron offers to pretend that he’s the father of Hannah’s baby and somehow this unusual arrangement, and the friendship that results, proves to be exactly what they both need. This book would be perfect for fans of Rainbow Rowell’s Eleanor and Park. Trouble has a similar structure with the narration alternating between Hannah and Aaron. In fact, the novel is almost entirely the dialogue or inner thoughts of either Aaron or Hannah, giving the book a very intimate tone. You really get to know their distinct voices and personalities. By the end of the book, I almost forgot that they weren’t real people. Honestly, I don’t often read realistic fiction, so I was surprised to find that I couldn’t put this book down – I stayed up until 3 in the morning to finish it and hardly noticed the late hour because I was so absorbed by the story. What I loved most about it was that it felt genuine – Hannah and Aaron acted like 15 year-olds dealing with some really difficult stuff. They weren’t always noble or responsible – they made a lot of mistakes, often hurting each other in the process. Because of this, the book is sometimes hard to read, and there’s a lot of strong language. The tone of this book could be summed up in one word: raw. 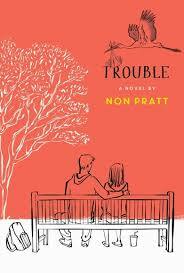 Trouble doesn’t shy away from its unflinching perspective of grief, betrayal, and anger. Fair warning – this book made me cry on multiple occasions. Some of the tears were sad tears, others were angry, and still more were tears of joy. I would rate it 2 out of 3 hankies. In conclusion, I highly recommend it for fans of books that are complicated, personal, and a little messy.